Divorce can be an extremely emotional and stressful process for anyone. Those who are facing divorce suddenly have to make difficult decisions regardless of whether they are emotionally prepared for it or not. They are aware that the decisions that they have to make will affect their future and that of their children. Some of the most difficult decisions that they have to make are those that concern their finances. The whole process of how to divide the couple’s assets and debts, for instance, can be overwhelming for anyone especially when the divorce occurs suddenly and the other party is caught off-guard. Getting one’s finances in order after a divorce may not be easy at first but with the proper advice and guidance, a secure and stable financial future is possible. The book by Jeffrey Landers called Divorce. Think Financially, Not Emotionally® is a great source of information for women facing divorce. It offers vital and practical information that women can use that will allow them to help secure a sound financial future for themselves and their children. The book discusses the different stages that a woman has to go through during divorce including preparing for the divorce, how to go about organizing all the necessary records and documents and how to protect one’s personal assets. It also guides its readers on how to go about choosing a divorce team which is usually composed of a financial advisor and a divorce lawyer. The book also has a chapter on special topics on equally important issues such as how to discover hidden assets and how to protect a business. Divorce. 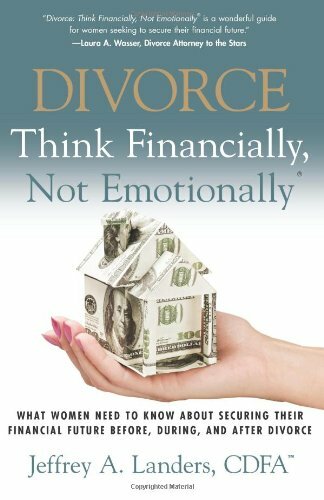 Think Financially, Not Emotionally® by Jeffrey Landers is a must read especially for those who are looking for advice and guidance on where and how to begin when faced with divorce. The author of the book has also pledged to donate portion of the profits from the sales of the book to the Bedrock Divorce Fund for Abused Women, a non-profit charity that helps victims of domestic abuse. For more details or would like to purchase the book, you can purchase it on Amazon.com today. So what are you waiting for?